While you are cooking the chorizo, heat the beans in a small pot or cazuela dish. Also, pre-heat a griddle or traditional Mexican comal on medium heat. When the chorizo is ready, heat the corn tortillas over your griddle-you’ll need two tortillas for each taco. 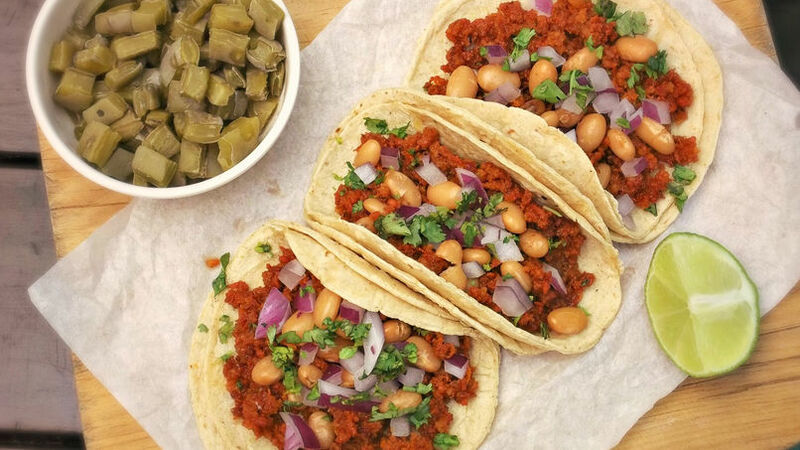 For this recipe you can also use soy chorizo (vegetarian), or flour tortillas. Of all the kinds of tacos sold in the taquerías in my town here in Mexico, the I like chorizo tacos the best. I grew up eating chorizo all through my childhood, but it was always as part of a delicious breakfast, alongside eggs, potatoes or frijoles. I didn’t know that you could make rico, Mexican-style tacos just using chorizo sausage, until I had actually moved to Mexico. For me it was ‘love at first bite.’ The best part was that chorizo not only was used for breakfast, but as a meal for lunch or dinner as well.